As the business competition gets increasingly intensified, a competitive business becomes increasingly dependent upon effective and reliable computing services empowered by integrated IT systems. Effective IT systems in an organization are remarkably delineated with the same characteristics: the right data and information can be delivered to the right user at the right place on time; the underlying IT supports can be easily adapted to the ever-changing business setting so that the first characteristic can be consistently maintained; business intelligence can be incrementally developed to facilitate business operations with the support of effective decision-making at a variety of organizational levels across the organization. IT systems can be effectively integrated through implementing business process management (BPM) – a newly emerging corporate IT concept, philosophy, and technology that help align business operations and IT supports in a competitive manner. 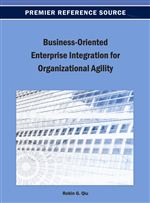 This chapter first explores the concept of aligning business processes with IT systems. Surely, computing service processes are derived from the correlated business activities within a business unit or across business units, reflecting corporate best practices. How BPM can be well defined, modeled, and managed while integrating enterprise systems is then discussed. As the best practices evolves along with the changes in business operations for a competitive advantage, approaches to building the necessary agility in support of managing the changes of IT-driven business processes is finally discussed. No matter what enterprise applications or IT systems an organization is using and how they were designed and developed, they essentially provide business operations with a variety of assistant and supportive functions, respectively or collectively. It is well-recognized that IT systems continuously improve the overall productivity in organizations. With the increasing complexity and dynamics in today’s global and digitalized business environment, it becomes clear that the best practices of an organization must be adaptable and easy to make a change. It is not uncommon that the business processes built in the integrated IT systems in an organization primarily determine how the organization’s business operations will be conducted. An organization thus has to have a very flexible and responsive underlying integrated enterprise system to meet the needs of its changing best practices. As briefly discussed in Chapter 8, a business process typically consists of automatic, semi-automatic, or manual business activities. A business activity is radically driven by a series of rules and logic which can be done online or offline. The computations of the embedded rules and logic in the business activity ensure that its empowered business operations will be performed in an efficient, accurate, and consistent fashion. As a business process performs in response to varieties of business events, the process should be dynamically adjustable with the support of business operation support and assistant services (Taylor et al., 2009). In other words, the underlying computing services should not be always simply executed based on a predefined set of business rules and logic. The process and associated computing services should be able to be adjustably selected, sequenced, and executed in a choreographed manner, so that the involved actions can be smartly coordinated across business units in an organization. In other words, if there is a need of change, instead of following the predefined business logic, new business logic can be optimally created and adopted on-the-fly to strive for the best.